Boys I was contacted by a "Friend" just a heads up theres some new "stuff" in the works. As you can see i was asked to keep the details confidential. However, I will post back my results in a weeks time. Cool man. Coming from you in particular with your 500whp NA quest in mind, this is encouraging. Keep us posted. It'll be a few weeks until I can get to a dyno. - an exciting but completely unspecified "breakthrough" leading to a "whole new plateau of performance"
But now, finally, give us the beef, if it really exists. Hats off to you my friend! I've asked for the full run conditions on the Dyno sheet and the run files 3 times now. Can you not see from the dyno graphs how the top end of the torque curve is flatter than normal, thus resulting in higher peak figures above 5000rpm? Peak torque in the midrange is still what you'd normally expect. If it was a happy dyno or falsified results, you'd expect this figure to be much higher also. So much negativity and scepticism in this thread, it's like wow....you really would think we're in a playground. Rather than attack Eurocharged and the paying customers whom are kindly sharing their results, how about we just give them the benefit of the doubt and ride out a sea of results from more customers? EC isn't a tuner that is prepared to lose it's credibility for the sake of several G's $ vs their long term reputation. Two cars around 20whp higher than normal, backed up by Dave and Tiff at Eurocharged and now Kriston. Seriously, everyone needs to take a chill pill and be thankful if this is proven to be true - I'm sure we'd all be grateful to have some more horses in our engines. From what I understand anyway (correct me in I'm wrong), Eurocharged have generally only really done ignition and fuelling when tuning the M156. I think only Weistec have really played with the variable valve timing before and that was proven when they tuned DadsC63 (fairly sure I've read it was Anthony that saved the day wasn't it? ) - So maybe now EC have worked this out and fair play to them IMO. That's what VVT is for and frankly with a huge increase in exhaust flow that you get from headers and decat, why would it be such a surprise that fine tuning the valve overlap on such a big displacement motor would net the gains that seem to be coming through? Also, for what it's worth, I have seen a stock dyno of a 507 (just one car though) at around 445whp and after headers/tune it was in the 480whp range (and I think this was on the old V5 tune), so while rare and unusual, it can happen. I was planning to get re-tune in June anyway, but now this new stuff makes it even more compelling. Finally - getting the VVT tuned on my cammed motor - fingers crossed mine doesn't fall flat on it's face like it has done so far. I'll be thrilled to be proven wrong. Sorry, but a bunch of new guys boasting about their "500whp" cars is not going to change anyone's mind here. When Dave and Tiff on official EC accounts talked, and then Kriston who is a known straight-shooter, well that's when **** got real. Looking forward to more details. You guys know that not all Eurocharged tunes are the same, right? If you're running a EC tune from the states off a handheld and Jerry then you have something different than what is being run up in Canada. And Canada is putting out strong cars. Ideally, this car needs to get to a track. But lets just say the OP ends up going to another dyno and it puts down 500 again. You going to just go on about how that is BS too? "We want more!" "We want better!" ....*Gets more*... "That's BS no way, impossible, nope, never happened so can't happen." Guys -- Relax. Get a little excited. Be cautious. But knock it the **** off already with the high school BS and curb your ego's. At the end of the day it is just a c63. We're talking $20k cars and you're minds are exploding like your "supercar" can't be touched and if someone else's is a little bit stronger and healthier than yours you've been robbed of your manhood. I'm sorry that the most mass produced AMG has different vehicles out there putting down different numbers. But when you have thousands and thousands of these things running around there is eventually going to be some that are different than others. Listen -- Call it what you want. Lose sleep over it, idgaf. But stop sitting here asking for more and then when you get it this happens. Again, I'm not picking sides here. And y'all know I've been here long enough, and through 2 c63's myself, to know that the 500 mark is something to be skeptical about. Anyone remember Avery? Anyway, OP -- Get this car on a different dyno, or, I'm assuming with what I saw on Instagram that EC Canada may even have videos of the run. Just go slap the number down again. Or go track it and let's see what you trap. And Jim, you've been here for 3 seconds posting up such random trash left and right about Vipers, and Kia's, and how you notice preteen girls noticing you. And now you want to start jabbing at people / companies who built this place? Really? I stayed out of your threads (aside from the one very helpful post about properly using that leather treatment product before you ruin the rest of your ****)... You may want to keep it that way. I was contacted yesterday evening, funny enough while I was reading this thread. My sentiments were exactly the same as most of you on here. 500WHP with straight bolt-ons is unheard of. That's literally 30+ wheel more then the average 460-470 WHP we have seen over the years. Trap Speed > Dyno for sure. But just from a pure data stand point, I have had every single bolt on dyno'd after-install on the EC Toronto Dyno. Give me a week with the new file, I will be seeing them in the next few days. Would be awesome to make some more power, until I see / drive it for my-self. I'm still thinking the OP's motor is a factory freak. all my stuff was done originally at REAL ST, i can take my car to the EC orlando dyno and see what it does there, i'll most likely go to the track tomorrow. ^If I must confess, my vote is towards factory freak as well. But if we get up to 475-485 being a new norm then 500 here and there wouldn't surprise me either. Just need more data. Until then let's all go for a drive, yeah? and I've also said that I think we would all be happy if its true.Thats my part. I don't think I have seen anyone else be too nasty. I think the level of vitriol has been equal on both sides, and this thread didnt even get off to the best start in the first post. I have seen some pretty classic "look at me look at me, oooh Mr Kotter over here pick me" behaviour, and Ill always be happy to laugh at that. But I dont think anyone has been too out of line or offsides, so Im not sure why we are getting the calls for another round of Kumbaya. EDIT: Ill take that back, since Infiniti has taken to sending nasty little PM's to people. You must be so proud of yourself, sending trash like that to people. Last edited by 604 C63; 05-23-2017 at 10:18 AM. Last edited by 604 C63; 05-23-2017 at 11:43 AM. I'm going to EC today to talk to them. I'll get all the other data these guys keep asking for. Bro lay off this thread. You are nothing but pure negativity and bs. And don't respond either. I don't give a **** about what you think. No, I'm going to keep posting here as much as I like. And you have to deal with it. Enjoy. Sure post if you insist but keep your 2 bit negativity to yourself. Who built your engine arun.6ix? Who as in the name plate on the engine? Or do I have any engine work done? This is definitely not a sales tactic. I did not know about this thread until someone called me and informed me of it. I didn't even know about the secret sauce being made. The three dyno graphs I posted were from a tuning day we did in MN. 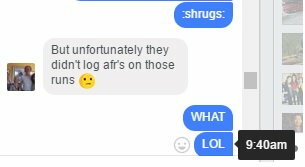 They didn't log AFR and I'm not lying to you. They tuned a car sending files without air fuel? I was there for this Jerry didn't touch the tune he said that he would lose power if he did any revisions. Tiff, are you left handed? The first time I thought they were frownies, and OH MAN DID THAT ALMOST SET ME OFF, you know how I am lol. I just thought maybe you did it from writing like that left handed. Just gotta put a space in there. I add smilies on a lot of my posts so people know it's me and not one of the other guys that work here. And some people take offense to it like I'm being sarcastic, lol. Oh well.